In the new two-minute-long ad spot, entitled “More Than Just Words,” Jeep delivers an emotionally evocative display of the American spirit at its finest. 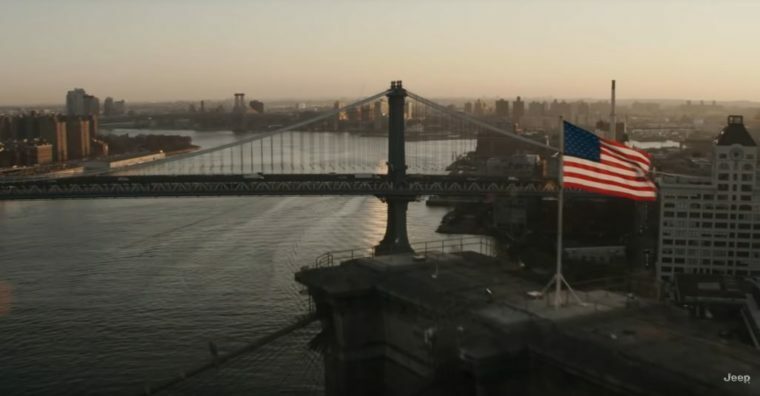 Set to OneRepublic’s largely wordless rendition of “The Star-Spangled Banner,” the video is a skillfully edited montage of visual poetry. “More Than Just Words” weaves Jeep’s history and reputation into a beautiful celebration of bravery, freedom, and the American spirit. Watch for clips Marilyn Monroe stepping out of a Jeep to greet American troops in Korea, and the historical footage of Jeeps dropping from planes and parachuting to earth. But it’s not all about Jeep — the commercial salutes our troops and first responders, revels in the beauty of America’s landscape, and celebrates a lifestyle of liberty, equality, and independence. “More Than Just Words” is a part of Jeep’s Big Game Blitz campaign, which includes seven other commercials. The American automaker unveiled the new advertisements exclusively on digital platforms like Facebook, Twitter, and YouTube. Jeep got immediate feedback on the ads — and “More Than Just Words” turned out to be a breakout hit. The response on social media was overwhelmingly positive. Commenters — American or not — confessed to shedding tears while watching the video, and praised its wholesome themes of bravery and unity. At the time of this writing, viewers have shared “More Than Just Words” over 200,000 times across platforms, and have left more than 50,000 comments on the video. It’s also shattering Jeep’s viewership records. With more than 106 million views across various forms of social media, the advertisement surpassed even the Big Game’s viewer count, which weighed in with an audience of approximately 98 million.